Although my blog is mostly adult content and will hardly ever fall upon the eyes of the younger CF generation, I was inspired by another blogger (CF Fatboy and his post which inspired me to write this) to impart advice I have learned and share my struggles of growing up with CF. These are the things I wish someone had told me when I was younger (not that I would have listened). None of this is to be taken as medical advice. Please consult your doctor before trying any new treatments or exercise program. I am NOT a medical specialist! 1. You’re going to feel out of place. This is true of everyone human being on Earth, even if it doesn’t appear to be the case. At some point in your life, you will feel awkward and as if you don’t belong. This just seems to happen more often if you have a chronic illness. When it happens, try to remember all your great strengths and assets. Remember that other people feel this way too and that thousands of other cysters and fibros have gone through similar feelings as well. You are not alone. If someone calls you out on why you do something different, think of it as an opportunity to raise awareness for CF. I know this is easier said than done. I went through high school feeling left out and alone a lot of the time. I shied away from my disease and never talked about it, but I regret that now. 2. Compliance is Key – You are NOT Invincible. This goes hand in hand with #1. If you already feel out of place, then taking time to do breathing treatments is hardly going to make you feel more “normal.” However, it is easier to feel normal by keeping up with treatments every day than ending up in the hospital multiple times a school year because you refused to do the treatments. I experienced this firsthand. I skimmed through high school doing treatments here and there but never fully committing to them. It didn’t matter, I had a mild case of CF and didn’t need to do the treatments. Then, one February night, I found myself in the E.R. with MRSA, P.A., and bronchitis. My sats were in the 80s and I had an extremely high fever. I didn’t get to go back to school for an entire month. Instead, I spent my days in a hospital with a PICC line, trying to recover – try feeling normal after explaining that to your fellow classmates. 3. Every case of CF is different. This is one that I am still trying to learn myself. Cystic Fibrosis is one of those diseases where everybody is affected differently by it. There are some things that are commonplace, but as far as infections, PICC lines, surgeries, and pregnancy go –everyone is very different. When I was 17, just getting out of the hospital, I met my first fellow fibro. He was 23 and had just undergone a double lung and heart transplant and we talked online all the time for months. Then suddenly, he wasn’t online as much anymore and I soon learned that he passed away. This hit me hard – harder than I ever expected. I was convinced that I also would pass away at the age of 23 (like he did) and that my CF was just like his case. Well, as my 23rdyear passed, I began to realize I didn’t have the ability to see the future. I then started seeking out other cysters and fibros so that I could share my journey with someone yet again. If you become part of the CF virtual family, you will unfortunately meet other cysters and fibros who pass away much earlier than they should. You will lose some of your friends, but you will also gain a deeper love and understanding for others dealing with our disease. You will also learn things that may downright shock you or encourage you to do everything you can to kick CF booty. For example, it was through the CF community that I learned of Hal Soloff, who is now in his 80s and fighting CF every step of the way. So stay encouraged, stay positive,and stay compliant. 4. There is never enough time so live fully, laugh often, and love unconditionally. This one has been drilled into my head more and more in recent weeks. As stated in #2, you are not invincible. You may live to be 102 or you may have a rogue piece of satellite come hurtling at you from the sky tomorrow – you NEVER know. Having CF, I think we often get pulled into the mindset that we will die before our family and friends. I don’t like getting into this mindset for a variety of reasons, but most of all it ends up creating a feeling that there will always be a tomorrow and that words/actions don’t hurt others. I have recently (in the past few years)decided to live my life as if there is no tomorrow for any of us. I’m not always successful, but I try really hard to abide by this philosophy. I don’t end conversations with a harsh word –EVER. I always say I love you. I give way too many hugs/kisses to the people I love. I thank everyone for all that they do on a regular basis. I tell people how much I appreciate a kind word or action they have done. The list goes on – I think you get the point. If something happens, I want those around me to know that I 100% loved them and appreciated them. I never want that to be a doubt in their minds. Also, if something happens to someone I love, I want to know that the last thing we were able to say to each other was positive. This is so important to me and it has made mea happier person. 5. Listen to your doctors AND don’t stopexercising. When I was younger, I believed I knew what was best for my body. In some regards this is still true. However, I am much more likely to listen to my CF doctors than ever before. If they want to me to increase my treatments or go on an antibiotic – I don’t fight them. I also don’t tell them I will do it and then never actually go through with it (ahhh my teenage years…how stupidof me). I believe that CF care centers work very hard to provide us with the most accurate and up-to-date information they can. They are doing the best they can to keep us as healthy as possible for as long as possible. I didn’t getthe medical degree (though some days I feel like it) and therefore I listen to what they have to say. If I disagree, I discuss it openly with them prior to leaving clinic and we reach a mutual understanding. Recently, their biggest push is for me to exercise. Exercise has been cited again and again as one of the best ways to keep lung function up. I loathe running and despise sweating, but I’m doing it for my health. I’m not 100% compliant with this yet, but I’mworking toward it. My advice is to stay active your entire life. Don’t let the early twenties slip you by as you head into college and lounge around in the dorms way too much. If you never stop exercising, you won’t have the issue of trying to start it back up again and build up your tolerance. 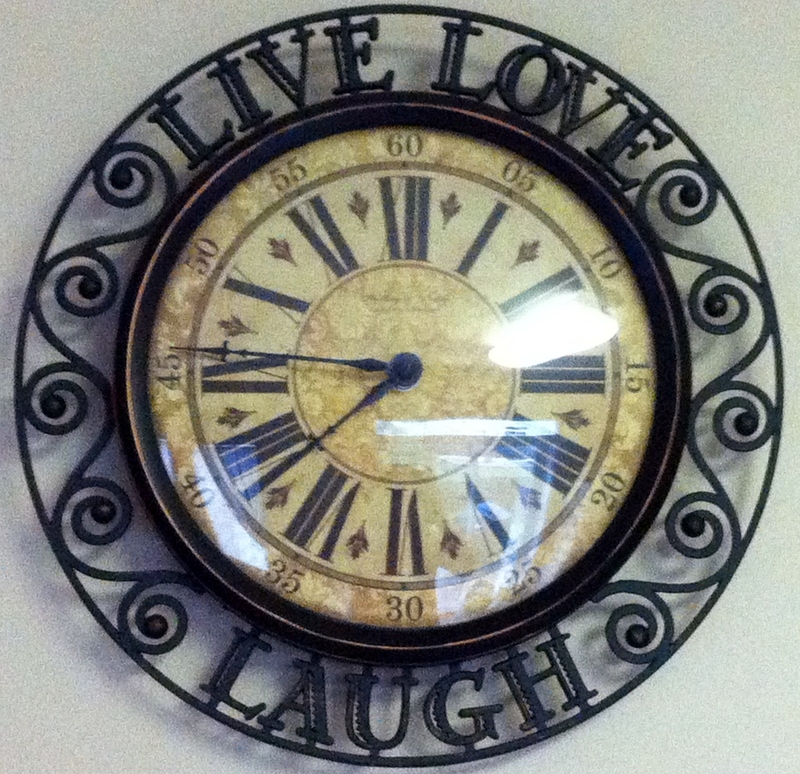 Our clock in our kitchen. I love it – ties into my philosophy beautifully! Well that’s it for now. This blog has gotten way too long, but these are 5 (technically 6)things I firmly believe in. I wish these had been shared with me by a fellowc yster or fibro at a younger age. Nowthe challenge goes out to all my fellow adult cysters and fibros out there:What advice would you impart on our younger generation? ← And here we go . . .
Good advice, Megan! You clearly put a lot of thought into this one. Thanks Jesse! You inspired me to write it – such a great idea on your part! Wow, what a GREAT blog. I don't even have to write my own because you took the words right out of my mouth! Thank you for the kind words Ronnie! I really appreciate the comment! 🙂 I think there is still a lot of advice we could all offer – these just seemed like the top pieces of advice that I wish someone had told me. I read this over and over, and doctors tell me this over and over. But it's still most powerful when it's from someone who HAS cf. I thought high school wold be the hardest with cf but now that I'm in college my schedule is even so more hard to keep! Thanks for saying this, I'm tackling the exercise thing as well.